The Energy Policy Simulator (EPS) is distributed with a set of input data representing the United States. This page describes the format and organization of the input data. It also provides guidance that will be useful for a user seeking to swap a single input data value (for example, to provide an updated U.S. value) or to swap most or all of the input data (for example, to cause the model to represent a different country). Input data can be edited without the need to own a paid version of Vensim, the program used to develop the Energy Policy Simulator. Vensim Model Reader, which cannot edit the model file, is satisfactory for users who want to examine the model, run the model, and even edit its input data. Input data sets may be developed that represent different countries. They can all be compatible with the same, country-neutral version of the model executable (.mdl or .vpm files). This means that bug fixes and new features can be implemented in a single place, and they will be available to all country-specific versions of the model (though in the case of new features, additions to the data set for each country may be required). The use of acronyms is necessary because of limitations in the Windows OS on file path lengths. If a user is looking at a variable with the EPS open in Vensim, it is possible to quickly locate this variable in the InputData folder because every input data variable in Vensim has a name that begins with the acronym used to name its folder inside the InputData folder. So, if a user is looking at a variable in Vensim, he/she can simply navigate to the folder that corresponds to the sheet he/she is viewing (for example, “bldgs” for the “Buildings - Main” sheet), and then open the folder whose name is the acronym that prefixes the variable he/she is examining in Vensim (for example, the “CL” folder for the “CL Component Lifetime” variable). There also exist two files at the root of the InputData folder: “cpi.xlsx” and “acronym-key.xlsx”. The first of these, cpi.xlsx, refers to “consumer price index.” This file provides source information and data used to convert the currency year of the dollars used in various input files to 2012 dollars. It is located in the root of the InputData folder because many input data variables required conversion of their currency years, and it is more efficient to include CPI source information and data in one place, rather than to include copies of it inside the folder for each variable that required currency year conversion. 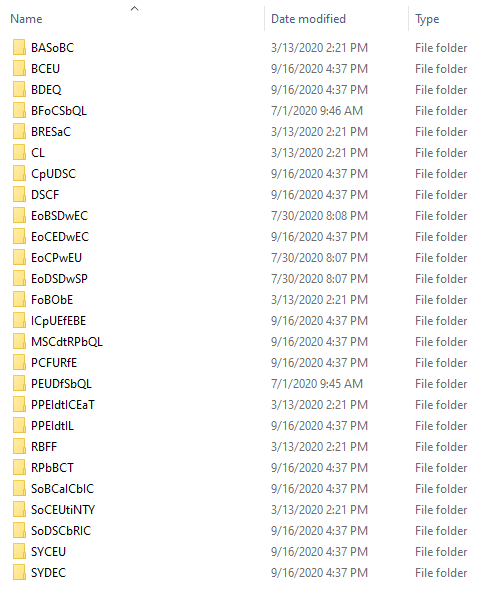 The file acronym-key.xlsx contains a listing of all of the acronyms used to name the folders for each data variable. In cases when a data folder contains more than one variable, the acronym key also lists all of the variables contained within that folder. 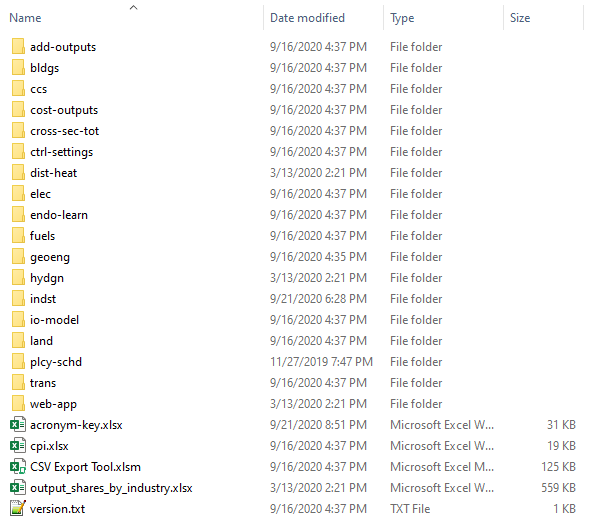 The key may be helpful in locating a particular variable of interest within the InputData folder. As noted above, it is not necessary to use the acronym key if one is already viewing a variable in Vensim. The key provides an alternative way to locate variables and might be particularly useful for users who want to find a variable without opening the model in Vensim. Lastly, acronym-key.xlsx includes suggested guidance on which variables are of high or low priority to update if creating a version of the EPS for a new country or region. The Excel file serves several functions: it provides source information for this variable, shows any calculations that were performed to obtain the values required by the model based on the informaiton in the sources, and formats the data correctly for input by the model. One or more of the tabs in each Excel file is designed to be exported in .csv format to generate the accompanying .csv file(s) in that variable’s folder. When seeking to change the input data for the model, one should always change the Excel file and re-export the relevant tab(s) to .csv format. One should never edit the .csv file directly, as it is too easy to make a mistake or misunderstand what is involved in a given variable without looking at the actual data source(s) and calculations(s) used to create the .csv file in the first place. In this case, .csv files begin with the acronym for the enclosing folder (“VFP”), followed by the acronym for the particular variable for which they supply data (“BCDT,” “BNCDTfVwSD,” or “BNVFE”), followed by the values of the subscript that define each table (“freight” or “passengers”). Hyphens are used as separators. The system of organization described above holds true for almost all variables. One or more variables may have different organization within their acronym folders to better manage unusual complexity of the input data or required calculations. (One example is “PERAC” (Process Emissions Reductions and Costs) in the “indst” (Industry) folder.) The manner of organization of files and calculations for these variables is explained in the Excel file(s) within their respective folders. All source data are carefully cited. 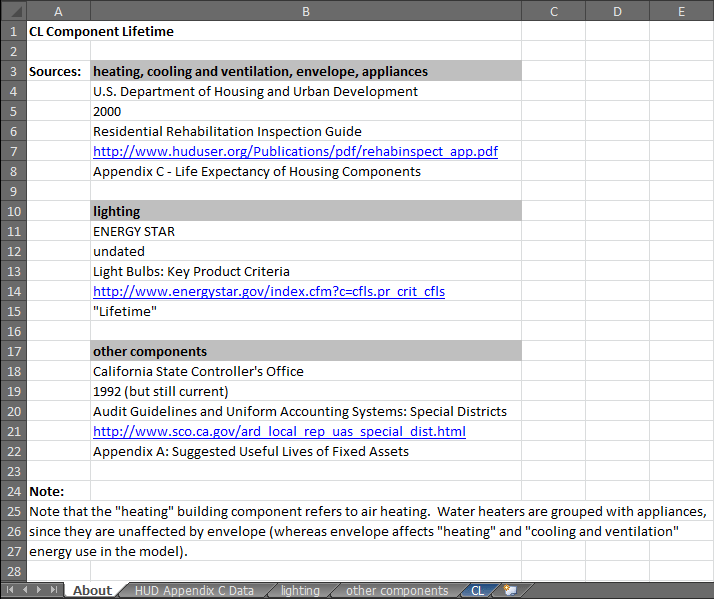 Citations appear on the “About” tab of each input variable’s Excel file. Author, year, title, URL, and a specific page/table/paragraph reference are provided whenever they are available. The aim is to make it easy to understand where the data were obtained, so users can decide if the data are suitable for their particular purposes, and they can more easily replace the data if desired. The model only utilizes publicly available data. The model works in real 2012 U.S. dollars. Currency of various years in input data files has been converted to be in terms of 2012 dollars. For time-series input data, values for each year of the model run (2015-2030) are used. Sometimes interpolation or extrapolation is necessary, if the source does not provide annual values for all of these years. For time-invariant input data, we use whichever source is most reliable or best suited to the model’s needs, often preferring studies that were conducted since 2010.